A part of Indochine Palace Hue team’s kitchen table. On the kitchen table, there were a couple of traditional carrying baskets; each of them was full of thorny pepper tips (Zanthoxylum nitidum DC.) – a common spice in Middle of Viet Nam. Next to it was a whole robust fruity tree of wild maracuja or bush passion fruit (Passiflora foetida) and a corner full of fresh good-looking vegetables. The most remarkable point was that on each type of spices hung a nice piece of paper printed basic information, from its origin, its usage, to how to combine with other ingredients. The presentation speech was also printed and hung on the basket. 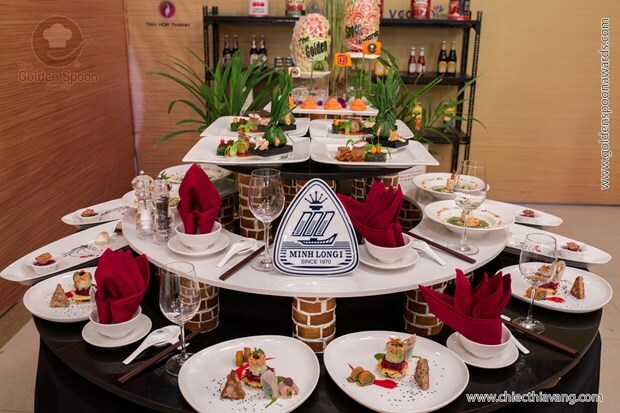 That’s how team 62’s chefs – Indochine Palace Hue – performed their sincere to judges and visitors, by providing relevant information about their golden dishes, and that’s also a tip to save more time. They were placed in the very first line, where attracted all attention from judges and reporters while many dishes in the menu were waiting to be completed. “Last year we got into this round, too, but because of emergency situation at work, we must drop. What a pity! We determined to make it this year”, said chef Tran Huy Cuong with his bold ascent of Hue. 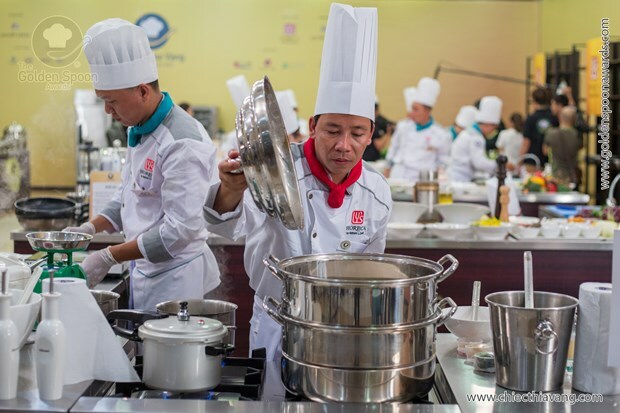 Together with his colleagues Tran Phong Huy and Le Duy Binh, those chefs dragged a whole “fan club” including all family members to the Northern semi-final round. Not only focusing on the quality but team 62 also invested in decoration by recycling paper cores and using granite blocks to set a unique party table in Northern semi-final round. Last preliminary, they had introduced all types of rural ingredients, telling a story from royal palace to kitchen corner of working class. In this round, they were confident to apply modern fusion style to rustic traditional dishes. Their golden menu includes: 1) Pomelo and green rice rolled fresh cheese in basil sauce – Salmon salad with beets and annona – Sautéed fresh figs – Rainbow smoked salmon rolls served with beet and passion fruit sauce; 2) Sponge gourd, wild maracuja, and river black tiger prawn soup served with soft shrimp cake; 3) Tre chicken steamed with raw sea salt grains and pollens, served with ginger caramel – Baked beef and thorny pepper tips rolls, served with stewed Da Le jackfruits and Tinh Tam lotus root, rice with cochinchin gourd and lotus seed, and grilled garlic; 4) Purple yam dessert, lemon-grass gingko in pink-lime sauce – 2 flavors chewy sesame candies – Thuy Bieu Thanh Tra pomelo soft cake. Chef Tran Huy Cuong presented, “Royal cuisine is Hue heritage and the brightest pride, which has been known by domestic and international visitors. We do have advantages if we bring our royal cuisine us to the contest. However, we’d love to prove that Hue cuisine has not only luxurious royal food but also interesting delicious rustic ones. From the most common ingredients, we would create and renovate them to classy dainty dishes.” Because of that reason, those Hue chefs took the chance to introduce as many of their remarkable dishes as thay could. 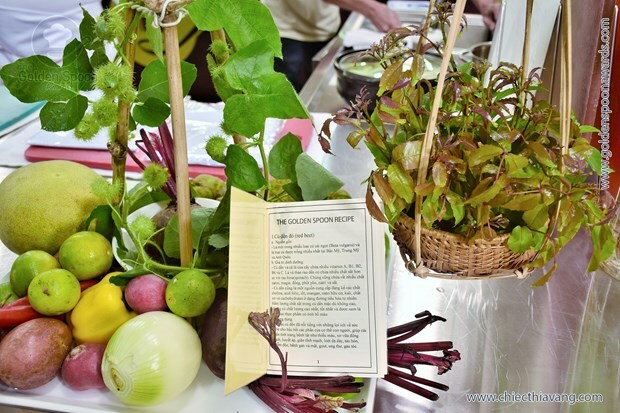 For examples, their appertizer included 4 dishes: Pomelo and green rice rolled fresh cheese in basil sauce – Salmon salad with beets and annona – Sautéed fresh figs – Rainbow smoked salmon rolls served with beet and passion fruit sauce. Chef Tran Huy Cuong took care of every step of his cooking process. 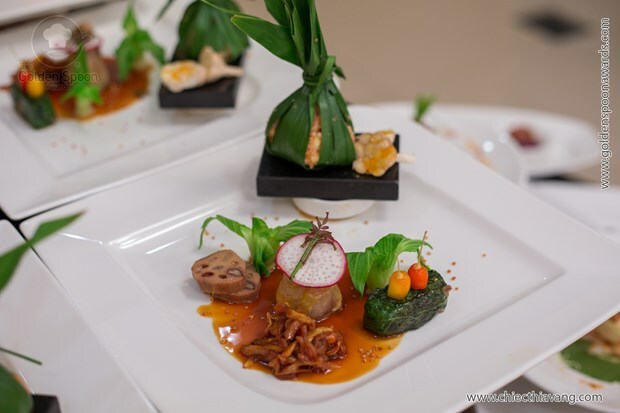 Chef Huy Cuong presented that the appetizer was a resonance of Hue regional specialties and highly nutritious food, displayed with a delicate theme. First to mention was salmon salad with annona and beet, an enterprise point when they decided to apply fusion method. The next dish was alternated from traditional fig salad to sautéed figs, a big step to place the dish on classy party tables. Appetizer included Pomelo and green rice rolled fresh cheese in basil sauce – Salmon salad with beets and annona – Sautéed fresh figs – Rainbow smoked salmon rolls served with beet and passion fruit sauce. According to team 62 chefs, that time of the year was right at peak season of pomelo so that they decided to use the best and succulent pomelos to make special dish with shitake mushroom, fresh cheese, and basil sauce, which all in a roll expressed a very autumn bite. 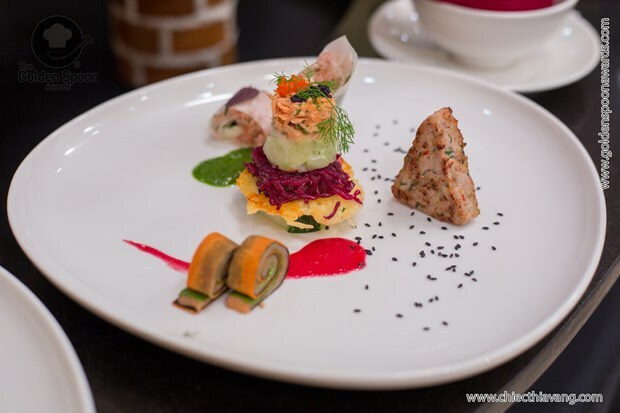 To create the best after-taste of the appetizer, they ended the first course by rainbow smoked salmon rolls served with beet and passion fruit sauce. That was a unique combination between Asian and European cuisine, in which nutritious salmon and nourishing beets and passion fruits were totally enough to persuade any picky gourmet. 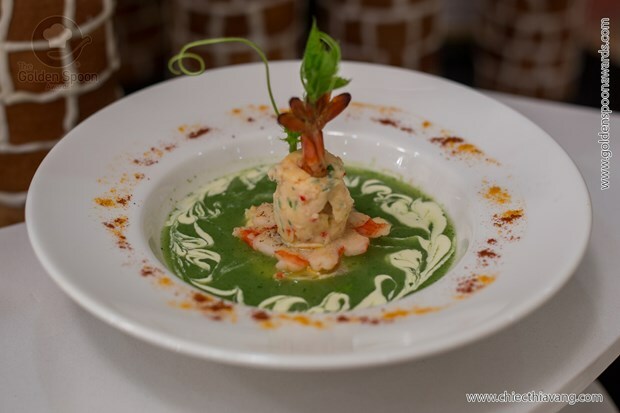 With the same idea, the seafood soup (sponge gourd, wild maracuja, and river black tiger prawn soup served with soft shrimp cake) was alternated from traditional soup. On the wild maracuja vines hung a piece of paper with clear note: Beside nutritious food, wild maracuja is also a natural medicine. It works as natural sedative or anti-insomnia. A dish from those miracle leaves is not only highly nourishing but also healthy and cure-able, especially for people with sleeping issues. Sponge gourd, wild maracuja, and river black tiger prawn soup served with soft shrimp cake. Tre chicken steamed with raw sea salt grains and pollens, served with ginger caramel – Baked beef and thorny pepper tips rolls, served with stewed Da Le jackfruits and Tinh Tam lotus root, rice with cochinchin gourd and lotus seed, and grilled garlic. For the main course, our Hue chefs steamed chicken thighs with raw sea salt and pollen. They chose Tre chicken, a naturally raised chicken in Nam Dong area. Chicken thighs cooked by the heat from sea salt would remain their smooth flavors while pollen would enrich nutritious value of the dish. A Luoi beef tenderloin was rolled with thorny pepper tips and lolot leaves then baked, creating a robust and impressive taste of wild spicy leaves. The luxurious meat was served with rural produces from the former capital, such as Da Le jackfruits, Tinh Tam lotus roots and seeds, and cochinchin gourd and rice wrapped in pandan leaves. The sauce, in the other hand, was quite simple yet memorable – ginger caramel sauce. 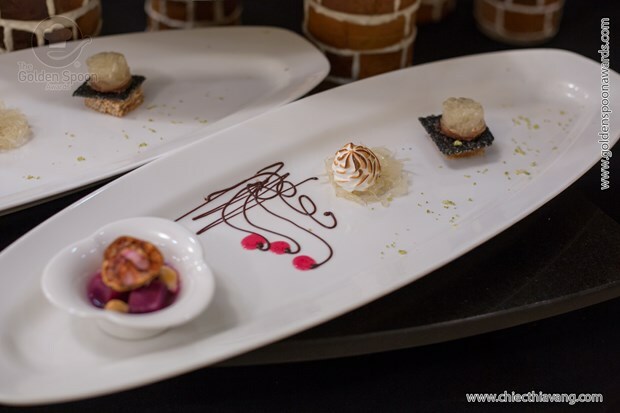 To complete the menu of Golden Dishes, team 62 brought a fusion dessert to please the jury as Purple yam dessert, lemon-grass gingko in pink-lime sauce – 2 types of Hue sesame candies – and Thuy Bieu Thanh Tra pomelo soft cake. Traditional famous sweet of Hue were 2 types of sesame candies, chewy and crispy; modern mark was Thuy Bieu Thanh Tra pomelo soft cake; and renovated dish was yurple yam dessert with lemon-grass gingko in pink-lime sauce. The combination of three dishes would leave rich yet unique taste of each and subdued the judges. Purple yam dessert, lemon-grass gingko in pink-lime sauce – 2 types of Hue sesame candies – and Thuy Bieu Thanh Tra pomelo soft cake.